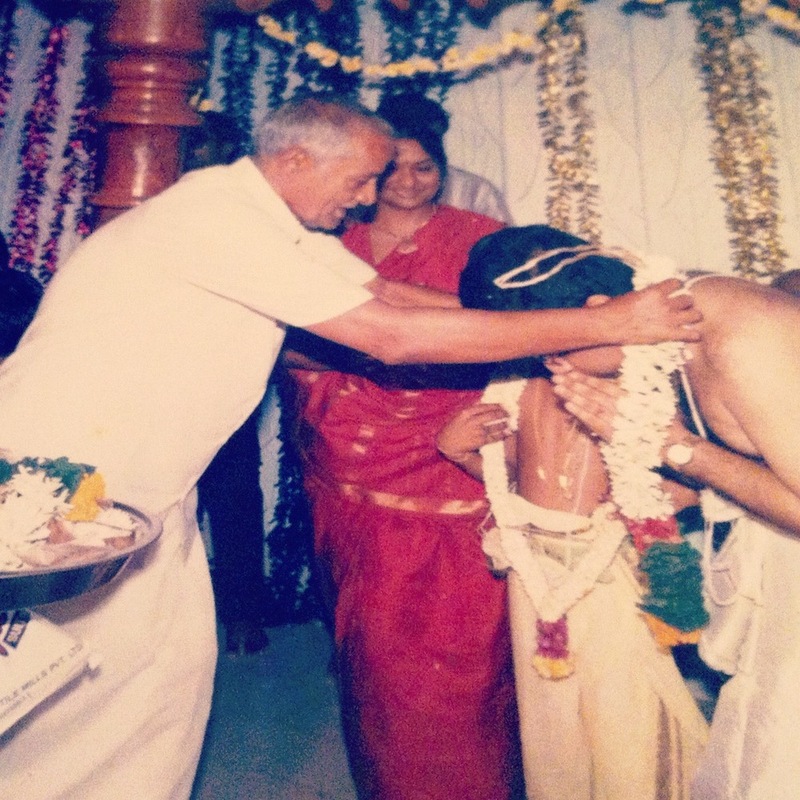 I had known Hanumantha Rao since 1982 when we moved to Saligramam. He lived right across from our house, a central government employee with very humble beginnings. My father’s automobile component manufacturing unit was also in Saligramam and we were facing severe financial trouble at that time. My father had invested a lot in R&D in successfully manufacturing precision ball bearings indigenously for the first time in India but the product cost was far more than the Japanese imported bearings. Hence a commercial failure. Hanumantha Rao was one of the founders of the Saligramam Raghavendra Swamy temple. So he introduced us to Raghavendra Swamy. Eternally grateful to him for that! The temple was very small then and he worked tirelessly to bring more facilities and to make it self sufficient. He was a friend, philosopher and guide to me as I needed to find strength to face the trying times my family was going through then. Faith is what gets you through any ordeal and he made me believe that Raghavendra Swamy will help alleviate our sufferings. My love for Raghavendra Swamy has grown into a Vriksham now from the small seedling of Bhakthi that he planted in my heart years ago. I was away from the country from 1984 to 1995 but was always in touch with him whenever I visited Chennai. From the time I moved back I almost always went to the temple every Thursday and would never miss seeing and talking to him for a few minutes. He also built another Raghavendra Swamy temple near Arani which was his home town. He had three daughters and one son and his share of family woes. But he was always at the temple on Thursdays to counsel so many souls who came there with serious problems. Raghavendra Swamy has spoken to him many times and given him instructions on various matters regarding the temple and replies to prayers he made for other’s problems. He became frail as he grew older and fell ill to sicknesses brought upon by old age. But his undaunted faith in Raayar always transmitted from him to others who came to him for help and gave them the much needed hope to survive. I met him the previous Thursday before he passed away. He had wheezing and looked very weak. When I mentioned this to him he brushed it aside saying that with age comes weakness. In my selfishness I asked him to pray that my daughter would get a good alliance soon and he said Raayar will never forsake me. He passed away on Dec 27 2011 very early in the morning. On 24th December which was Dhanur maasam amavaasai he told his friend that five of his friends have passed away on that auspicious day and named them. My father was one of them. He added that he still had a few more days to go. Apparently the friend did not take it seriously. On the same day he called his son-in-law and clearly explained his financial holdings. On the morning of the 26th he called his daughter and told her that his time had come and he was leaving that night. He also told her not to tell anyone as that would make people start visiting him, but made her promise to inform all those he knew after he passed away since he said they would be very offended if they were not informed. That night he told his son to sleep next to him. Around 11pm he woke him up once and asked him for the time. When his son said it was 11 pm, he said “You please continue sleeping, there is still some more time.” Then he woke him up around 2am and went to the toilet with the help of his son. Then he asked him to wake up his daughter-in-law. He then thanked them both for taking care of him so well all these years, especially his daughter-in-law for preparing food that he liked etc. He then requested them to take good care of his wife. He blessed them with all good things in life. Then with the agility not possible for a 83 year old man, he rushed to the next room, saying he did not want to be in a room filled with beds. He found a chair under the photo of Lord Lakshmi Narasimha and sat in it. Chanting Ragahavendra Swamy’s name he breathed his last while holding his wife’s hand in one hand and his son’s hand in another. Yes, some lives are really amazing.!!! My sincere prayers for him.! Thanks for keeping your word and posting this. As you say “Some lives are amazing”. I have heard of one Mahan from people who knew him well that he had given early warnings at least 2 years in advance and multiple times.